Parnell street has transformed itself from what most Dubliners knew it as. When I first frequented it on a regular basis back in the early noughties, it was a bleak, desolate place. It now bustles as Dublin’s unofficial Chinatown. 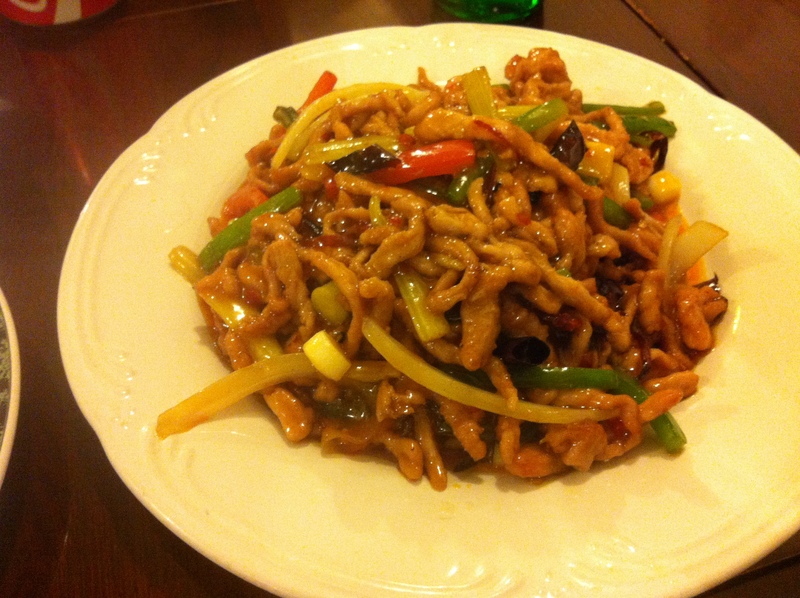 The vast majority of Chinese food dished up in this country is bland and non-descript. It is largely the same no matter where you go. Not so on Parnell Street I was told. Here you see the Asian community eating authentic Asian food. So recently I dragged a friend along to try The Sichuan House Chinese Restaurant (to give it its full title) a try. I was comforted on entering to see not one single waving feline, nor was there fake bamboo or a fish tank to be seen. Equally we were certainly in the minority as Irish- a good sign. The surrounding s are basic. But I like that. We perused the menu and skipped over some of the intestinal and more unusual parts of beast on offer. We both went for the chicken satay to start. I spent two years of my life in Indonesia when I was younger- and they know how to do satay- Thankfully they did here also. The sauce was nutty, sweet and just a little spicy. Everything it should be. It was served on a bed of crispy shredded lettuce. For mains I opted for fried shredded pork in a hot and spicy sauce. It was huge. It could have fed us both. It was a tasty dish. The pork was cut a little fine for my liking making for a slightly strange texture, but the sauce was vibrant and there was plenty of veg to liven the dish up. Mark’s Kung Pao Chicken lacked a little punch but was happily eaten all the same. The rice served with both was perfect and could easily be eaten with chopsticks. The bill came out at just over €40. Which included a beer (€3 ish) and a few Cokes (€1.50). Overall it was nice. It was a hell of a lot better than most ‘Chinese food’ we know of. However it lacked the wow factor. There were dishes paraded by throughout the evening that definitely were not on the menu we were given and they looked delicious- so it could be a place to point and order. I think if it is a Szechuan/Sichuan place, to get the ‘wow’ factor you’d really need to go for the Szechuan stuff – huge flavours, loads of heat, absolutely amazing. Was at a place in London a few weeks back where I went through a plate of ‘pig tendons in spicy salt’ (deep-fried trotters, basically) for a short cut, and we had a whole crab with loads of the famous Szechuan peppercorns, as well as amazing long beans with pork. It’s a phenomenal cuisine and one that certainly makes it worth your while to go with a local or to attempt some of the lesser-tried bits of the animal. I can recommend the feet. Well I had read that yesterday- which is why I went for something on the spicy end of the spectrum- but it was mild in my estimation…. The other thing I tend to do in restaurants is to really annoy the staff by making them decide what I’m having for dinner. It works! Yep that’s a great tactic! Done it a few times myself! It certainly has Mike! Wackers is still there the last time I checked- but it’s bustling with Asian shops and restaurants now!